Fleet Maintenance System™ (FMS) is a system which allows a company to manage fleet inventory, preventive maintenance, repairs, fuel, parts, and much more. 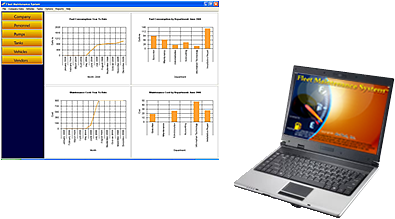 FMS provides detailed reports for fuel usage, fuel economy, maintenance costs, and vehicle service needed, along with graphical representation of each report. FMS has an optional module that will import data from any digital fuel pump system providing an industry standard, serial, or Ethernet interface. Cut down on fuel theft by employees. Prevent damage to vehicles by keeping up with routine maintenance. Determine vehicles that need to be replaced. Keeps track of fuel consumption. Keeps track of vehicle maintenance. Run reports to determine when vehicles are due for routine maintenance. Run reports to determine cost of maintaining vehicles.